Outline Sam, Dean, and Mary devise a plan to lead the group to safety. Meanwhile, Jack takes an interest in Lucifer and his family's history. Sam walks into the resistance outpost with Lucifer trailing behind him. Lucifer takes the credit for Sam being alive and claims he is there to help defeat Michael. He also reveals that without his grace keeping the portal open, it will close in 31 hours. As Lucifer begins to approach Jack, Dean immediately intervenes, angrily warning Jack not to listen to Lucifer and demanding Lucifer not talk to Jack. 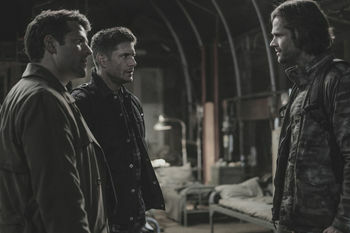 They argue over the semantics of who is Jack’s family, angering Dean enough he orders Gabriel to kill Lucifer, but Gabriel claims he is not strong enough to do so. All the fighting begins to upset Jack, who disappears. Castiel grabs some binding handcuffs out of Dean’s backpack and uses them to restrain the weakened Lucifer, which Lucifer does not resist as a show of good will. Sam apologizes to Dean for leading Lucifer to them, but Dean absolves him, telling Sam he only cares that he is alive. They hug and Dean admits that he thought he lost him. The boys then approach Mary, keen to return with her through the rift. Mary admits she is not planning on going back with the boys, telling them that she understands what they went through, but that she respects the people at the camp, and she has fought beside them and doesn’t want to abandon them. As Dean starts to argue with Mary, he looks to Sam to back him up, but Sam respects Mary's wish not to leave her people behind, and instead suggests they take the people with them back through the portal where they can safely plan on how to attack Michael. When Jack returns to the camp after thinking on what to do about Lucifer, he decides he wishes to listen to what Lucifer has to say, despite Castiel's protestations, and make up his own mind after hearing his perspective. When Dean intervenes, Jack insists that Lucifer can help them kill Michael. The Winchesters and the people at the outpost decide to return to the larger resistance group. On the way to the camp, Gabriel is sent ahead to scout and comes running back with angels after him. In the standoff, the angels are disintegrated by Lucifer, who dissolves his handcuffs, revealing that he knew they wouldn’t hold him but was demonstrating that he was no threat. When the group arrives at Singer Auto Salvage and meets with Bobby, Dean asks about Charlie, and learns that she has gone with Ketch to take out an angel kill squad. They brief Bobby on their plan. Bobby is unconvinced, deeming it a dumb idea, but takes it to the other leaders later that night, and they agree that they’ll take a vote. Lucifer continues to give Jack his own perspective on how he was treated by God. Gabriel interrupts and argues that Lucifer was not a victim in his dealings with their father. Later, Gabriel tells Lucifer that Jack will see what he is, a cancer that corrupted the innocent and beautiful humans. He tells his brother that there is no chance of redemption for him, not anymore. As Gabriel walks away, Lucifer is affected by his brother's words and a single tear falls. When Bobby learns that Charlie and Ketch have been taken in a trap, Dean, Sam, Cas, and Bobby follow up with the person that told Charlie about the kill squad. As the man is unwilling to talk, Castiel uses his powers to interrogate him, and he eventually gives Dean and Sam the information they need. Ketch and Charlie have been taken to an empty Gas-N-Sip after being captured. The angels torture Ketch while Charlie watches, but Ketch proves resistant, prompting the interrogator to reveal that he has placed a call to an “expert”, who soon arrives in the form of Castiel. Still in Jimmy Novak’s vessel, he has a previous eye injury, a pronounced facial tic, and he speaks with an accent. He tells a bound Charlie that eventually everyone hits their breaking point and that once he finds hers, her secrets will flow out until her mind no longer exists. As he places his hands on Charlie's head and begins his process, the lights go out. As the angels check the perimeter, the Winchesters and Jack attack, killing the angels and saving Charlie and Ketch. As Castiel flees, he comes face to face with his double near his vehicle. Fascinated, Castiel questions Cas' allegiance to the humans, telling him they are the same. Cas agrees, before stabbing Castiel with an angel blade and killing him. At Bobby’s, the vote has been taken and they have all agreed to go to the other world. Questioning how they will be able to get everyone to the rift, Dean notices an old school bus in the salvage yard, and after tuning it up, they pile on. When Gabriel questions letting Lucifer drive, Dean tells him it's so that Castiel can keep an eye on him. As the group prepares to leave, Jack tries to split from the group to go and kill Michael, but is talked out of going by Sam and Lucifer. The group arrives to find the rift starting to close, but to their shock, it begins to glow open again as Rowena doubles her efforts in the Bunker. Ketch, Mary, Jack, and Charlie lead the refugees through the rift into the Bunker until Sam, Dean, Lucifer, Gabriel and three others are left behind. Michael dive-bombs into the area, killing the three others in the resulting explosion. As Michael makes his presence known, Lucifer stands to fight him, but a short exchange leads to Lucifer's defeat. Michael notices Gabriel, who tells Sam and Dean to go, saying that he will not run anymore. With their archangel blades in hand, Gabriel moves on Michael. The two exchange blows, and Michael is able to overpower Gabriel, and stabs him with his blade. Gabriel goes limp in Michael's arms, and he places the dead body on the ground as Sam and Dean get ready to leave. Dean goes through the rift first, and as Lucifer comes up, Sam holds him back. Lucifer argues he’s hurt, but Sam throws him to the ground, asking how he thought things would end, and goes through the rift just as it closes, before Michael can reach it. At the Bunker, the refugees are celebrating their escape. However, Jack looks upset, and Dean is telling Castiel about Gabriel sacrificing himself and reassuring Cas that Sam handled Lucifer. Bobby toasts their escape and assures his people that they will find a way back to get Michael and save the rest of their people. He also toasts Sam and Dean and welcomes them to the family. In Apocalypse World, Lucifer is striking a deal with Michael. He tells Michael he needs him because he knows how to create the rift. He states that he only cares about his son. As a despondent Lucifer looks at his brother's dead body, Michael agrees to terms: Lucifer will get Jack, and Michael will get everything else. Sam: Hey. Listen, I'm sorry about all this. Dean: Well, then you got nothing to apologize for. I thought I'd lost you, man. Mary: I fought beside these people. I respect them. I respect their cause. You can't expect me to just abandon them. Mary: I -- Sam... Dean... I know what you went through to come find me. But these people are being slaughtered. They need me here. Dean: No, we need you, Mom. We do. Dean: We have been mopping up the world for years. Years. We have been knocked down. We've been possessed. We've lost friends. We've lost family. We've lost each other. And we never walk away, ever. And sometimes, we should've, because not every fight everywhere can be won. It just can't. Right? Tell her. Sam: I think Mom made up her mind. Sam: Mom doesn't want to leave these people. So let's take 'em with us. Jack: Who locked you up? Lucifer: My dad, 'cause I told the truth. See, He loved humans so much, He couldn't see their flaws. And I told Him about it, and He got mad. He got -- He felt like I was... personally dumping on His masterpiece, and so He kicked me out. No time-out, no 'go in the corner,' you know, anything like that. Just... gone, banished. And yes, as Cas says, I have done some bad things. I had my reasons, and I just want the opportunity to get better. Doesn't everybody? Don't you? Lucifer: So I was just shaking up the old family tree for, uh, young Jack here. You know, talking about the good old days. How tough Pop was. Right, G? I mean, we -- we butted heads a lot, you know. But, uh... you know, I think -- I think, in hindsight, I should've given Him some slack 'cause, He's, uh. You know, being a dad is tough. Gabriel: Okay, you think Dad was a 'bad guy,' and you were a victim? You were not a victim. That was just your excuse. Lucifer: My excuse for what? Gabriel: For it all, Lucifer. For it all. Gabriel: Oh, is this the part where you tell me that, uh, Dad made up all those so-called lies about you? Got it. Lucifer: Yeah! Yeah, Pop locked me up, okay? Gabriel: Don't you get it? Humans were innocent and beautiful. But you... you couldn't stand that the old man loved them more than He loved you. So you tempted them and you corrupted them just to prove how flawed they were. Lucifer: You better be careful, man. Gabriel: Dad saw that your evil was like the first few cells of cancer... that it would spread like the disease unless He cut it out. That is why He locked you up, to stop the cancer. But it was too late then. And guess what? It's too late for you now. Castiel (AW): You align yourself with the h-humans. Castiel: I vastly prefer them to angels. Castiel (AW): Don't think that you are better than me. Well, we are the same. Lucifer: Sam, what are you doing, man? I'm hurt. Please. Sam: How did you think this was gonna end? Bobby: All right, listen up. We made it. Don't know much about this place, but it's a place without Michael, so that's a turn for the better. I don't want none of you goin' soft on me because we are going to get ourselves ready and go back home and set our people free. Dean: He's been here for five minutes. Look who's taken over the joint. Bobby: While we're celebrating, let's not forget our brothers and sisters who didn't make it. They will never be forgotten, and we will do right by them. And now a toast to our new brothers -- Sam and Dean Winchester. Thanks, boys. Welcome to the family. Michael: Why should I trust you? Lucifer: I saw how they do the spell. I know what it takes. It's some blood, some fruit, a glow-y rock, and then... Bam. We step through, both of us. Michael: Everything else. Are we agreed? Exodus is the second book in the Jewish Torah and Christian Old Testament. The book details the liberation of the Israelite's from slavery under the Egyptians, as Moses attempted to lead them to the Promised Land. Lucifer: I don't understand all the hostility. You... need... me. I am a walking weapon. I know this Michael. Heck, I beat him. So how 'bout a little R-E-S-P-E-C-T? Lucifer spelling out "respect" is a reference to the 1967 Aretha Franklin song "Respect". Lucifer: Wow. I have been waiting for this moment for so long, I almost don't know what to say. This... this dad thing is sort of new to me. So, um... Do -- do you have any questions that you wanna ask? Don't let my status as a legend hold you back. Now just... fire away. Jack: Why does everyone hate you? Lucifer: Huh. Wow, he just got right to the -- right to the point. That's good. That's good. Good question. Um... So you've, uh, probably heard the stories. Right? Anything ugly happens, any evil befalls the world, it's my fault. Fake news. "Fake news" is the dissemination of untrue information as fact. The phrase became popular in the 2016 United States presidential election by then-nominee and current president Donald Trump, who continues to use the phrase to deflect any news he doesn't agree with, regardless of its actual veracity. Lucifer: So I want you to think about this. Your Grandfather is God. Think about that -- of all the powerful families in history... Forget the Tudors, Trumps, Jackson Five. We're numero uno. The Tudors were the family who ruled Great Britain from 1485 until 1603. The Trumps are in reference to President Donald Trump. The Jackson 5 were an American family singing group which gave Michael Jackson his start in the music industry. Dean: Sam, go back there and check out what Helter Skelter's sayin' to the damn kid. "Helter Skelter" is the title of a Beatles song from their 1968 White Album. The phrase would become adopted by Charles Manson, who believed it was a coded prophecy telling of an upcoming apocalyptic race war. Mary: Dean, like it or not, Lucifer is Jack's father. He's going to take an interest in him. Dean: So what, we're supposed to just let Lucifer drag him over to the dark side? Mary: Jack isn't going to the dark side. He'll see Lucifer's true nature. And he'll see through his own eyes, not yours. Dark side is a reference to the Star Wars film franchise, where the dark side of the Force is innately tied to the distinctly negative ethical paradigm of the Sith. It is used to refer to someone becoming evil. Ketch: Are you familiar with a place called Boardwalk? Ketch: Well, it's very near Park Place. Go to Oriental Avenue and take the B&O Railroad straight to Hell. Ketch is referring to places named on the board of Monopoly. It is strange that Ketch, who is English, would make reference to places in the U.S. version of the game, rather than the UK version. There is an actual Supernatural version of the game. Gabriel: Dude, it's me. I've known you since the stars were made. You can't change. You're incapable of empathy or love. You live to be worshiped or feared. Or both. Lucifer: Okay. I-I see that you've -- you've drunk the Kool-Aid. Fine. Drinking the Kool-Aid is a figure of speech used to refer to believing something without critical examination. Its origins are with the cult followers of Jim Jones who drank cyanide-laced punch on his instruction. James Lafazanos, who played Resistance Traitor, previously played Hotel Manager in 2.08 Crossroad Blues. Dagan Nish, who played Resistance Fighter, previously played Cliff in 7.14 Plucky Pennywhistle's Magical Menagerie. Charlie and Ketch are held at a Gas-N-Sip and Castiel kills his Apocalypse World counterpart outside of the gas station. In 9.06 Heaven Can't Wait, Castiel briefly worked at a Gas-N-Sip while he was human under the name "Steve." Apocalypse World Castiel's clouded over left eye may be a reference to Naomi's drill, which she used to rewire the minds of the angels by drilling through their eye sockets. Unlike the other Apocalypse World angels, the Apocalypse World Castiel drives a vehicle despite the Fall never depriving him of his wings like the Winchesters' Castiel. Instead of teleporting away when the angels come under attack, the Apocalypse World Castiel chooses to drive away. Castiel (AW): More than one of us. Fascinating. Castiel: I've gotten used to it. The Castiel of Apocalypse World's reaction to seeing his counterpart can possibly be seen two ways. Firstly, he is simply fascinated seeing another version of himself. Secondly, the "more than one of us" could be in reference to Castiel being brought back as a Seraph after Lucifer killed him in 5.22 Swan Song. Apocalypse World Castiel having not gone through the same experiences would have remained his original class of angel. He is seen to be weaker than the Winchesters' Castiel who easily overpowers his counterpart. This page was last edited on 20 April 2019, at 03:33.